For any young hockey player who recently has turned pro, an established guiding presence is crucial to their developmental success. Ryan Strome of the Bridgeport Sound Tigers of the American Hockey League has been fortunate to have received this guidance from one of the best talents in the National Hockey League. The 20-year-old center hails from Mississauga, Ontario, the same hometown as John Tavares, captain of Bridgeport's NHL parent club, the New York Islanders. "Growing up I always knew who he was," Strome said. "We actually played in the same minor hockey organization, but he obviously was a bit older. I remember watching him play a little bit." Tavares, who entered the weekend tied for third in the NHL with 23 points, was taken by the Islanders with the first pick of the 2009 NHL Draft. Two years later the Isles chose Strome with the No. 5 pick. Tavares stepped in to fill the role of mentor for the young prospect. "The last few years, especially after getting drafted by the Islanders and getting to meet him, he's really taken me under his wing," Strome said. "He's a very professional guy and obviously one of the best at what he does in the world, and to be able to have that type of role model and someone to be there every day to talk to, to be your friend but also to learn from, is huge. "You can never learn too much from a guy like that, someone that's so decorated at such a young age and who's still growing. That's somebody I aspire to be and it's great to be around that." Strome found himself around Tavares on nearly a daily basis this summer, when they lived and worked out together while preparing for the 2013-14 season. "Being able to train with him this past summer was pretty big for me," Strome said. "He really opened my eyes to what you need to do away from the game and away from the gym. I think that's helped me immensely and I hope I can continue to learn those things [from him]. "Not every young guy can say that they're close enough with the captain [of an NHL team] to be able to talk to him, so it's nice to have a guy that understands the growing pains a little bit and knows what it takes to be a young guy playing pro hockey." After being drafted by the Islanders, Strome remained with Niagara of the Ontario Hockey League, where he had been playing since 2009, until making his professional debut with Bridgeport at the end of the 2012-13 season. He scored a goal in the first period of his first game, April 2, and finished with seven points in 10 games. 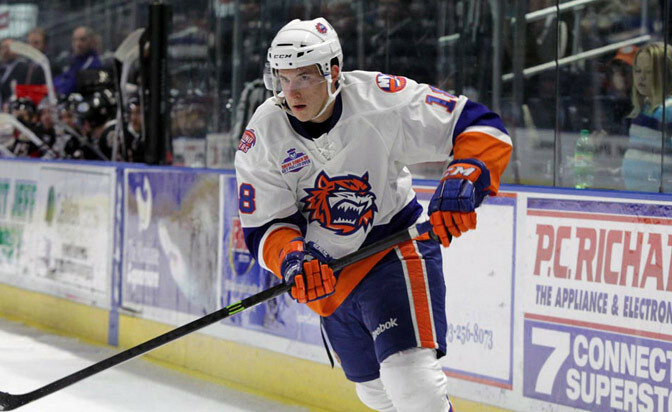 Strome's first full season in the pros has come under the direction of Sound Tigers coach and NHL veteran Scott Pellerin, who values the example Tavares is able to set for Bridgeport's predominantly young roster. "To me, John Tavares is probably one of the top five players in the NHL," Pellerin said. "To see his development as a young player to where he is now, to see him compete and be a factor in every single shift and to have that leadership on and off the ice, it's a great role model for not only Ryan but for the rest of our organization [as well]. "He [Tavares] is responsible defensively, he's responsible offensively, he carries a lot of weight and he handles it with class. He's somebody that as coaches we always point to and say, 'This is a guy that plays hockey the right way.'" Tavares' hockey expertise further has strengthened an advanced understanding of the game that comes naturally to Strome, according to his coach. "The first thing I see is that he has such a high hockey IQ," Pellerin said of Strome. "Guys talk about that, his hockey sense, his vision on the ice, his ability to see things after a shift. "Right now he's making the adjustment to the American Hockey League very well. His hockey sense and his talent are there and it's all the little details that he's putting together. He's bringing up that compete level every shift and he's being rewarded with quality ice time and is making plays. He's a big part of our team right now for a very young hockey player." Although his rookie season barely is six weeks old, Strome already has seen the initial adaptations made to his game coming to fruition. He leads Bridgeport with 16 points in 12 games, and he's tied for second among all AHL rookies. "I think I've really grown into being a two-way player and being someone the coach can count on," Strome said. "I'm getting more comfortable each game out there and am getting accustomed to the bigger players. I think on the ice I've made some adjustments that have helped me out and I've been producing. "At the same time, I think off the ice I've started understanding what it takes to be a pro every day. You come to the rink and it's your job now. You can't just turn it on and off when you want." An emerging aspect of Strome's role with the Sound Tigers has been his ability to create opportunities for his teammates. "He makes players around him better and there aren't too many players who can do that on a consistent basis," Pellerin said. "His ability to pick up the pace of the game to make plays at a high pace but also to be able to slow the game down to bring people to him and open up space for other players, that's something that I wish I could say I could teach. "It's an ability he has that he uses to his advantage every shift and it's a great quality. That's why he was such a high draft pick." Pellerin said he has no doubt that Strome's work ethic will carry him a long way as a professional athlete. "He is so determined and hungry to get better and to be a big part of this team and this organization," he said. "We still have a ways to go and he knows that and is prepared to put in the work." Strome knows maintaining a high performance level is just one of the numerous components necessary in making the jump to the NHL. "You're trying to take someone else's job, so it's pretty serious," he said. "No one's going to roll over for that job easily so you have to continue to work every day and continue to grow as a person and as a player every time you're at the rink." He is hopeful that his hard work will land him a spot alongside his good friend Tavares at some point in the near future. "I think if I can continue to do that over the next little while I'm going to get to where I want to go," he said.